Co-founder of Angie’s BOOMCHICKAPOP, Angie Bastian, knows what it means to LIVE OUT LOUD. 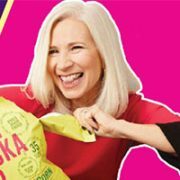 She and her husband, Dan Bastian, started their business popping sweet and salty popcorn from their garage in 2001 as a means to start a college fund for their children. Angie is known for her entrepreneurial energy and passion towards empowering others, especially women and children, to follow their dreams. Angie will share her journey of starting this BOOMING company and how she found success and meaning in doing so. During this session, Angie will tell her story of creating a brand and company that are congruent with her values, beliefs and passions.